Sometimes everyone needs a little help with exercise. If you are the type of person who does not feel comfortable working out with a group of people or if you have particular goals that can be best achieved with the help of a trained instructor, then a personal training program is definitely for you. 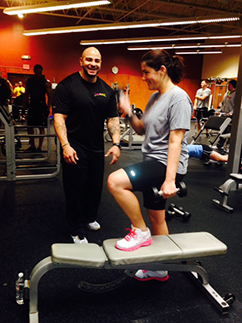 There are a number of reasons why individuals choose to hire a certified personal trainer. If you are training for a specific sport, you can strategically create a sport-specific training program and map out a plan for the coming competition. If you have a heath condition or an injury, working out with an experienced trainer can help you develop a program that is safe and effective. Your trainer will also help you determine fitness goals that are realistic for your case and they can hold you accountable for the results of your workout program, keeping you motivated to stick to your program. An experienced trainer will work closely with you in order to give you the best experience and results with your personal training program in Foxboro, MA. In your training program, you will have someone who can look after you, ensuring that you are doing every workout routine in perfect form. By setting realistic fitness goals and preparing a specific schedule to do your workouts, you can maximize your time in the gym. For more details about personal training programs, contact Answer is Fitness.